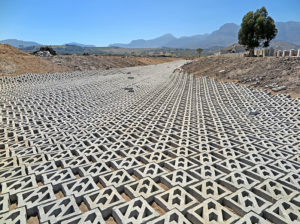 Over 79 000 precast concrete Terracrete grass blocks, manufactured by Terraforce licensee, Klapmuts Concrete, have been used to line a 6.5m wide section of 1.8km stormwater drainage channel next to what will become the Vlakkeland low-cost housing estate in a peri-urban area on the outskirts of Paarl, Western Cape. A truly green storm water channel with Terracrete blocks! 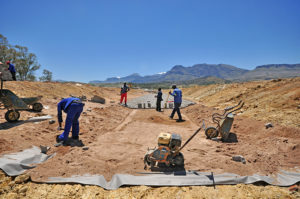 The main storm water attenuation pond under construction. The partially completed entrance to the main attenuation pond where channel one forks. 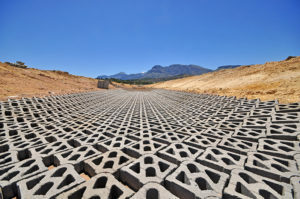 The channel forms the major component of a Sustainable Urban Drainage System (SUDS) designed to protect the new housing estate from water flows during heavy downpours. 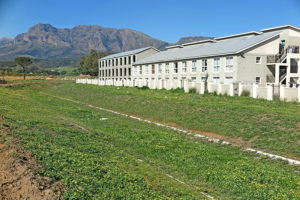 Specified by the Western Cape’s Provincial Government, it was designed by consulting engineers, Lyners and Associates, based on input from GNEC (Guillaume Nel Environmental Consultants) and some initial stormwater surveys undertaken by Graham McGill of Graham McGill Consulting. The lined section of channel one under construction. Newly laid Terracrete grass blocks in channel one. 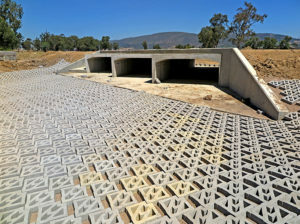 The channel forms part of a system which has been designed to ensure that stormwater flows are managed and dispensed in a controlled manner. 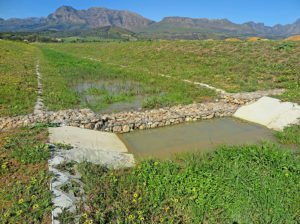 Several tributaries and stormwater pipes which previously flowed into several evaporation ponds, situated on the land earmarked for the new housing estate, now drain into the main channel, channel 1 and into two tributary channels channels 2 and 3. Progress on the extensive Terracrete channels. The blocks meeting up with a concrete crossing. 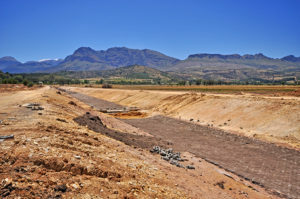 The unlined section of the main channel was designed to accommodate a 1:100 year flood (50.2m³/s) whereas the lined section can accommodate a 1:5 (18m³/s) year flood. 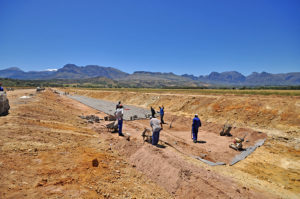 The deployment of the Terracrete blocks and mini gabion dams, which were built into the downstream section of channel 1, reduce flow-rates and allow the SUDS system to better filtrate any runoff. The other major component of the system is a large attenuation pond which was excavated at the bottom end of channel 1. Partially completed channel one in which the bio-charcoal fill material can be seen inside the Terracrete blocks. The channel after the plants have fully established, a completely successful, green transformation! 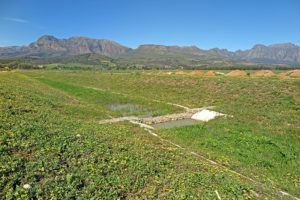 The pond further reduces the flow rate and prevents surges by releasing water gradually through a 450mm outlet pipe at the far end of the pond. However, when water volumes are such that the pond fills to capacity, the overflow pushes back into the main channel at the entrance to the pond. 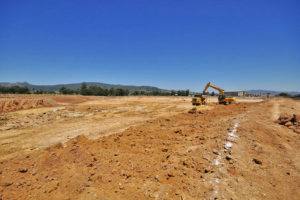 In addition, a secondary and smaller attenuation pond has been excavated immediately above some culverts which have been installed under a main tarred road adjacent to the estate. Grass has been planted on the floors of both ponds to minimize dust during dry periods and encourage water infiltration. The finished channel with a Gabion weir. 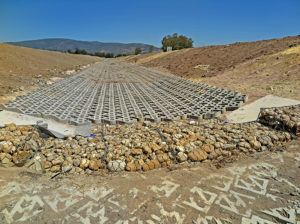 The main channel is composed of four material layers: the sub-soil which was compacted with rollers to 93% MOD AASHTO; a layer of Grade A2 geofabric, which prevent the blocks from settling too much and allows filtration while preventing the washout of locally sourced bedding sand (20-30mm); and the Terracrete grass blocks. After, with the development in progress. The Terracrete blocks are being filled with a bio-charcoal material and mushroom spores, the former to absorb pollutants in the water and the latter to recharge the charcoal and keep it fit for purpose. 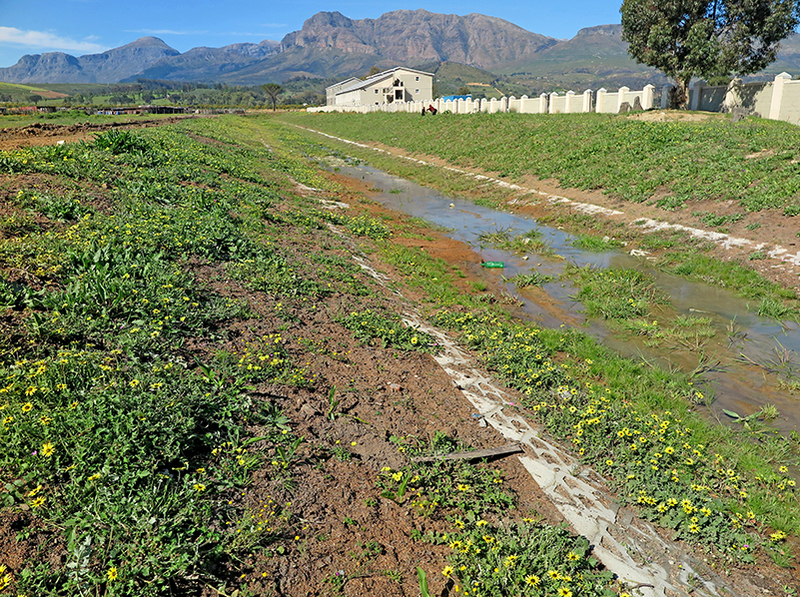 Specific plants are currently being grown in a nursery to be planted in and around the blocks, these were chosen for their water purification properties, as the storm water from this channel ultimately ends in the Berg river. The channel banks above the blocks are being planted with grass. The soil mix act as an ideal planting medium, and also functions as a cleaning agent in the water. An on-site survey was conducted to identify the locally indigenous vegetation naturally occurring on site and surrounding areas. The national vegetation Book (Mucina et al. 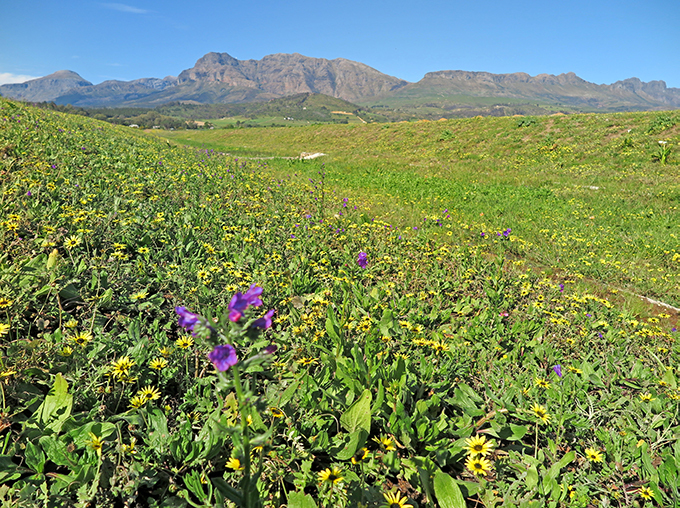 2005, Mucina & Rutherford 2006) was consulted and species carefully selected for rehabilitation which naturally occur in Swartland Alluvium Fynbos (FFa3). Act as a natural filter, cleaning the water. 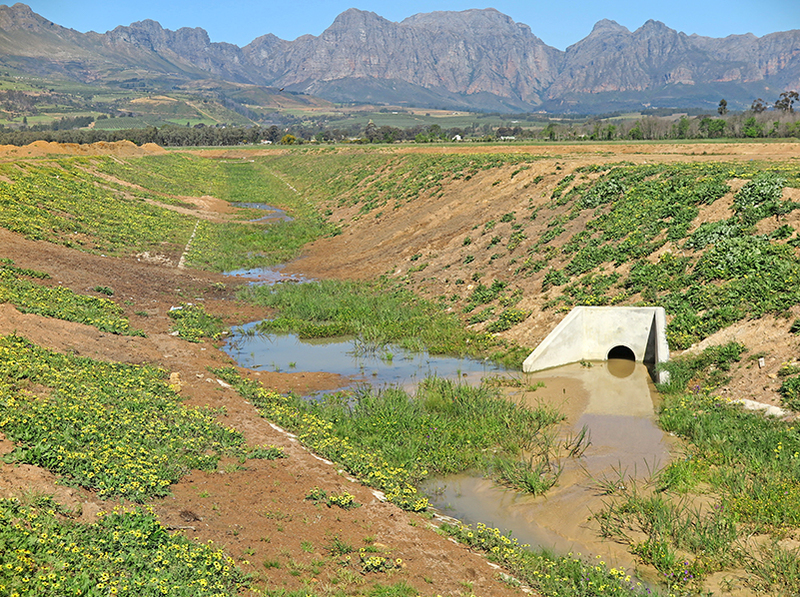 Will minimises and prevent erosion of the storm water channel. Will slow down the flow of high volume storm water. Positively contribute to the visual and aesthetic value of the storm water channel. Positively contribute to the biodiversity and ecological value of the area. 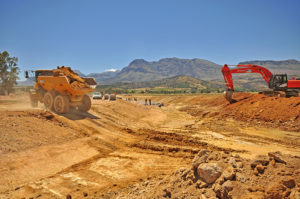 The main channel, the bulk earthworks, including the attenuation ponds and other channels, were constructed by JVZ Construction.